I was born in Essex and now live near Oswestry on the Shropshire/Wales border. 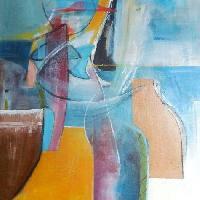 I trained in London at Waltham Forest School of Art and then the Royal Academy Schools London. I occasionally run courses and workshops in mixed media painting and drawing and am sometimes available for private tuition. Influences come from personal experience of landscape - in particular the far south west of Cornwall and the Welsh borderlands ....and also from the written word. At present I am part of and exhibiting with a small artists¶ collective called Earthscape. I am a founder member of Borderland Visual Arts and have been a member of the Sandford Gallery Group, the Chicken Art Gallery Co-operative and Helfa Gelf.......currently showing work at: Knighton Fine Art, Dotty Dog Gallery Shrewsbury, The Willow Gallery Oswestry and Mid Wales Arts Centre - Newtown.